With blogging tips flying around like crazy at the moment but also knowing that for every one person that hates them there's two people wanting more tips to read! I thought I'd write a post on easy mistakes to make that I myself have made in the past and have learnt from. Of course these aren't rules to blogging and you can blog in whatever way you wish - it's your domain after all! 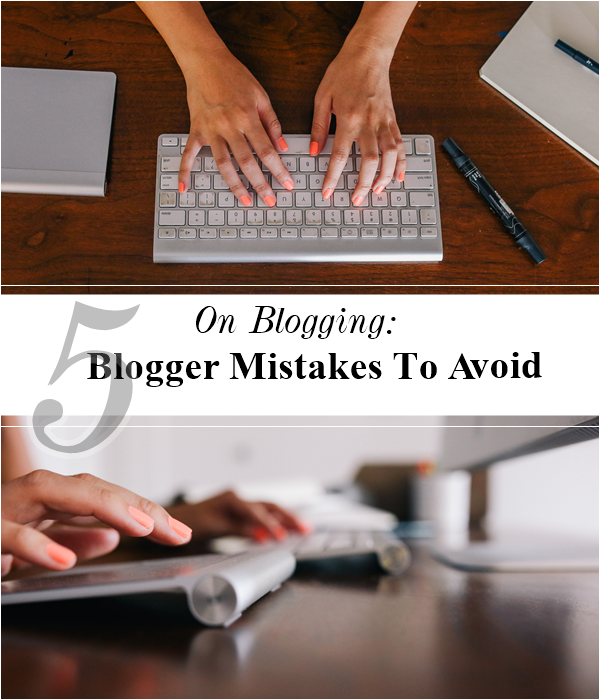 But to stop a few headaches and the risk of blogger burnout here are my own tips of what mistakes to avoid. I've done it, you've done it, we've all done it. It's just all too easy to pluck an image from Pinterest or Google images without noting down the source, but the bottom line is it's illegal and bloggers have got sued before for A LOT OF MONEY!! Eeep. The easiest way to not get sued of course is to simply credit with a link to the source and avoid professional photographers work all together. Or use your own images - simples. Or use royalty free images... I personally have never found these to be that great but have used a few images from Death to the Stock Photo before - in fact the above images are from there! If you still can't be bothered not crediting just remember you could randomly get sued (a bit of a biggie there!) and imagine if the same was done to your own blog images - annoying and plain rude really. Ahh blogging dramaz, how they seem to crop up from time to time, actually more like day to day. But with a large collection of like minded people it's bound to happen. So there's no point in blaming it on the fact that as beauty bloggers we are predominantly female and that's why it happens - something I hear too often! Though it may be tricky at times not to add your own opinion into the mix even if it includes fellow bloggers you know in the long run it's best to stay out of it. I find due to it generally being on social media there isn't an end or resolution unlike in the real world and overall it will leave you with a bad taste in your mouth. Plus 9 times out of 10 it's nothing huge, so brush off them shoulders and show you're above it! Unfortunately there's a fine line between inspiration and being a copycat and you need to know it, as no one takes well to feeling like their work has been copied. Seeking inspiration from other blogs as a collective is fine but be aware of how much inspiration you are taking from a single blog especially when it comes to their header and layout. If you are wondering if your blog is looking too much like someone else's, then it probably is, so make sure you do some changes and maybe look at magazines or other sources for inspiration if you can't think up ideas of your own. Once you've been blogging for some time you will start to get press releases and enquires from PR companies and no doubt you will be pretty thrilled about it! Even years down the line you will pleased that you have the connections and relationships you do with these companies, BUT and it is a but, you have to remember the PR person however friendly is wanting to promote their clients and sadly for as little as possible.... generally free or the price of lunch. So sticking to what you will and won't do for free is a must. If that's accepting PR samples and including them in blog posts if you like the product or it fits, then do that but stand your ground when asked if you can write about the product by 'X' date or feature it in a stand alone blog post. That's generally sponsored post territory and it's fine to state that. As PR's have what their client wants in mind, you too should have what your readers and yourself want in mind! This kind of follows on from my last point about not doing things for free but it's actually more about knowing your worth... a tough thing to do when no one is really talking actual figures. Firstly if you are receiving enquiries from brands about paid for posts/sponsored posts then you can be sure you're at a level where you can charge and you do have a worth to them. Talking to close blogger friends with similar blogs may be of help to figure out how much to charge or working out how long the sponsored post suggested would take to complete and how much your time is worth + what they are gaining from it. Again, this is where you can under sell yourself but as a basic guideline, even if you're fairly new to blogging you shouldn't be doing anything for under £50 - ever. Lots of info here and some point I really could have wrote whole blog post on but hopefully this has been of help to some!